Hire Frank Sinatra Tribute Acts in New York, United States - No Agency Fees! Find the best Frank Sinatra Tribute Act in New York for your Wedding, Party, Corporate or other Event Entertainment in minutes! With us you can enquire & deal 'directly' with a New York Frank Sinatra Tribute Act...that means no middle man & no 'Agency Fees' added! Want To Receive A Range of Quotes From Available Frank Sinatra Tribute Acts? 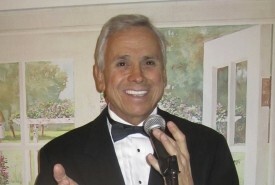 Great Sinatra BirthdayPresent For Mom By Jennifer F. on November 22, 2016 Johnny entertained at our mom's 80th birthday surprise party singing songs of Frank Sinatra who mom absolutely adores..He also sang dad's favorites of Tony Bennett & Elvis and did many guest requests. Johnny sang an absolutely beautiful rendition of mom & dad's wedding song called "Because of You" to which they danced again. FANTASTIC !! Johnny is a super sweet guy with a great sense of humor and had mom and our guests laughing with his jokes and audience participation stuff. He turned a restaurant cocktails and dinner gathering into a festive party event. Mom was blown away and we all had a terrific time. Johnny made mom's B'day super special and one that we'll always remember. Mom says you brought back wonderful Sinatra memories and she keeps referring to you as Frankie often saying " that Frankie was really great" ..And so I guess she really bought your Sinatra impression. Special Thanks from All. WANT TO RECEIVE A RANGE OF QUOTES FROM Frank Sinatra Tribute Acts?